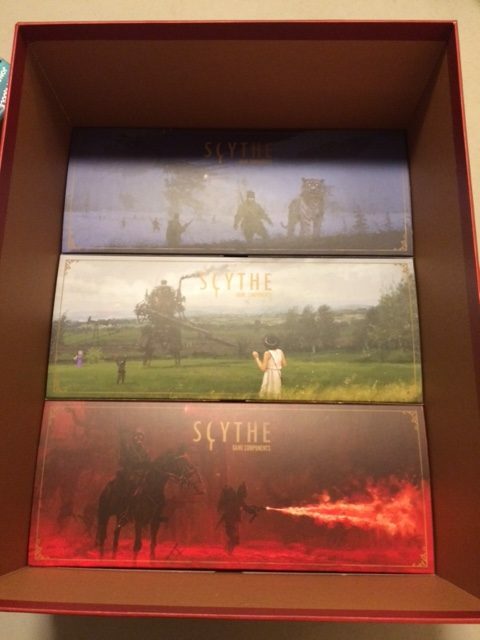 The Scythe Legendary Box is designed to hold the Scythe core game plus all 3 expansions (the expansion components, not the boxes), the various accessories, promos, and a custom insert. We were inspired to create this box thanks to the feedback from people on this blog post. Not sure how the MSRP US$25 becomes AU$50. That’s an expensive box. Hello, I just filled out a product request form for the Legendary Box. I was wondering, does it look as if there are enough that there will perhaps be a reprinting of this? Love your work. Thanks for your time. We’re near certain that we’ll make more at this point, but I’m waiting to hear back from my manufacturer about a few things. That’d be the Australia Tax kicking in as per usual. Sadly for something this size it doesn’t look likely to be able to save anything by sourcing from overseas, since the first one of the US partners I checked wanted about $45 postage to ship the box to Australia. Hello, is this “legendary box” compatible with the “Scythe – Box Organizer” ? And your English is perfectly good! No need for asking for excuses, mate ! How do the 3 tucked in boxes work? Are they split by expansion or by component type? I guess my main question is, should I keep my current expansion box and the wind gambit when it comes out or is this designed to just store the content, not the box itself? algirdyz: The 3 tuckboxes aren’t made for any specific component type–they’re just meant to help prevent lots of loose components from sliding around inside the box. I would recommend keeping everything you have until you get the Legendary Box so you can decide what’s best for you. I like how you listened to your fans and created something they want. I was wondering if it’ll be available at SPIEL ’17? Thanks! I don’t think it’ll be ready by Essen, though (even if it were, I’m not sure who would have it there, as we’re not attending Essen). I think The Broken Token are attending. Ah well, I’ll have to wait till it arrives at my local FLGS in Dubai. That’s great news about The Broken Token! But unfortunately the box won’t be ready in time for that. Hmm…I’ll talk to them about that. There’s no way the box will arrive in time for Spiel unless they air freight it, which I highly doubt they’re going to do. This is Greg from The Broken Token. We’ve been running this “Pickup at Spiel” option for awhile, but unfortunately like Jamey mentioned, the box won’t be available in time for us to bring them. I’m not sure if our website will allow us to disable that shipping option for just this product. So please consider this a heads-up that we will not have them in Essen. We actually have to freight our products over there in a few weeks. I just preorder the box. Is it possible that you can add in it some new achievement sheet for the expansions? Pre-order for the SLB is already sold out in Canada. Will there be more later? Shipping from the US is more expensive than the box itself. Francisco: Check back later today, and I’m going to allow those retailers to add more. Thank you very much, it worked!!! Ah, too bad it’s not available from Miniature Market or Meeple Source, or am I mistaken? Roy: That’s correct. We gave Meeplesource the option to carry it–I love working with them–but it’s much bigger than the items they typically send out, so it didn’t fit into their logistics system. Sorry! We didn’t feel they were a good fit either. You have said for both Coolstuffinc and Miniature Market “just not a good fit for this product” are you willing/able to expand on what you mean by that? I know I’m trying figure out how to get a copy and not being available from either of them, or my local store is making it more difficult. Okay, so it’s not exactly that it’s not a good fit for them–it’s that it’s a better fit for companies that specialize in selling custom inserts and accessories. We offer a number of viable options in the US from which you can choose–it’s just as easy to order from any of those stores as it is from CSI or MM. Will this new BIG BOX house additional expansions beyond the 2 already released (Invaders and Wind Gambit)? I saw there is another expansion on the horizon. Just curious if this will solve all containment issues FOREVER. :) Thanks! Thank you so much for this! I just placed my Pre-Order with Broken Token, they are local so I can skip the shipping fees. It is odd how excited I am for this. Will this be available at Gen Con? No, we just started production on it–it’ll take a few months to make. Any shot you’ll have some at PAX Unplugged in November? Dylan: We don’t attend many conventions. :) PAX Unplugged isn’t on the very short list of conventions we attend. Ok. Just pre-ordered from Broken Token! Thanks!! No french retailer for the legendary box? Because of the logistics involved, we could only work with a few retailers. We offer 3 in Europe for your convenience. Since it’s the same size as the base one, the old base game box won’ fit inside, right? Flavio: That’s correct. But you can use the lid from your original box on the Legendary Box. Aah! It’s so nice that this will come also to Europe retailers (Docsmagic) :) Sometimes shipping boardgames from US to Finland has been almost as expensive as the game itself. 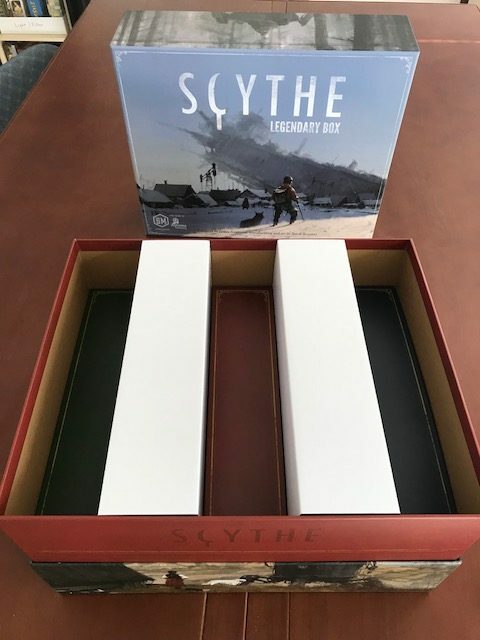 The Scythe Legendary Box is designed to hold the Scythe core game plus all expansions (present and future), accessories, promos, and custom inserts. Will it work even without broken token insert ? Docsmagic.de: Frais de Port a France est 9,99 Euro! Any chance of seeing this on Amazon at MSRP – the shipping alone from these sellers majes it hard to justify the cost. Fontanet: It’s possible that some of the sellers listed above will sell it on Amazon, though they would likely increase the cost to cover shipping (someone has to pay for shipping! :) ). I would recommend that you consolidate an order of other stuff with your purchase of the box, whether it’s a custom insert, accessories, or other products. I think his point was that the above listed sellers have really bad shipping options/prices and Amazon (itself, not those sellers on Amazon) might have much better shipping options. A sentiment I agree with especially since I live in Europe, but not the EU and apparently, this is really hard to ship to for the majority of sellers. That’s a fair point, though I’m not aware of any partner that is overcharging on shipping. As far as I know, they’re all charging a fair price based on what they need to pay the courier. If there is such a partner, please let me know about it. I’ve worked with Amazon fulfillment before, and I’m confident they would not properly pack these boxes, and they would arrive damaged. Well, the problem is that these couriers simply do not offer a good shipping option to certain countries (including charging VAT even if it does not apply). For example, i can offer totally fair prices for a shipment and not add anything for my own gain, and it may still be a bad option because I only offer a very expensive one instead of a cheaper (and perhaps slower) option. Will there be one type of Legendary Box or will there be localized versions? Thanks for the swift reply. That is a relief. Jamie is there anything you did not think of?? Will the tuck boxes accommodate sleeved cards? The tuckboxes aren’t really designed to hold a specific component, just loose components in general. However, as you can see from the dimensions listed above, there’s plenty of room for them for the biggest cards in Scythe (70x110mm) whether or not they’re sleeved. The bottom is not the same as the original Scythe box bottom–it’s also a full-size illustration. I’m 99% certain this will receive a ‘no comment’, but given that Invaders fit into the base box, and the known size of Wind Gambit……are we to believe that the final expansion is going to be BIG? Will there be an insert in the box? 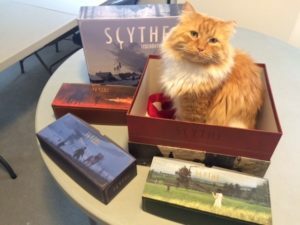 Curry: Nope, no insert, as we wanted to be respectful of all of the custom insert companies who have poured extensive resources into making nice inserts for Scythe (Stonemaier gains nothing from those custom inserts other than happy fans). 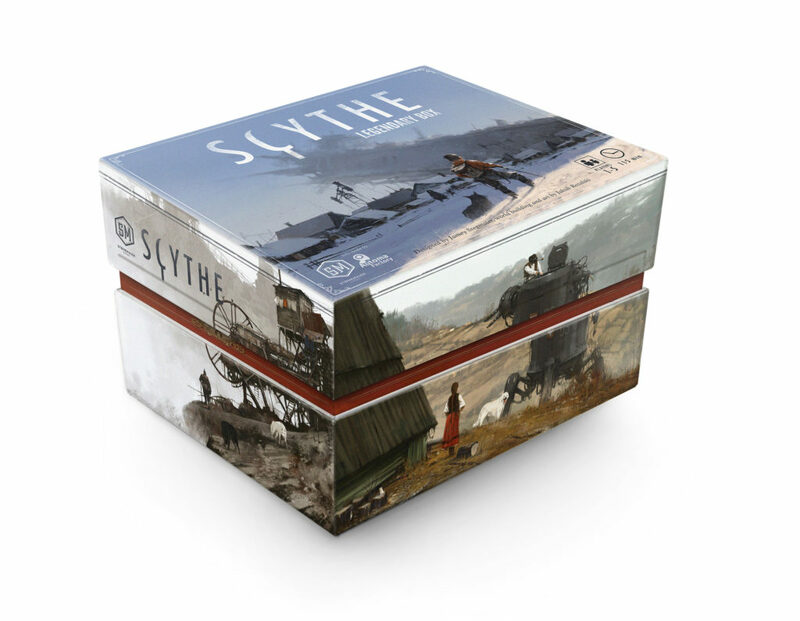 You can, however, transfer the plastic inserts that come in Scythe and the expansions over to the Legendary Box. 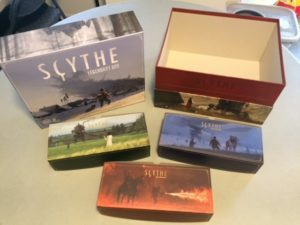 Will the broken token organizer for Scythe work in this new box? What???? So this new box does not offer things like TBT organiser???? This new box is empty ??????? I don’t mean to be rude, but the text on this page could not be more clear about what this product is. It’s a big box with 3 smaller boxes inside of it. That’s it. I did. It’s different than the original box bottom. Will Feldherr foam tray for Scythe + expansions work in this new box ? Yes, any tray that fits in the original Scythe box will now have twice as much room to fit in the Legendary Box. Is there any way to get Cool Stuff on this list of retailers? We did not select Cool Stuff to be on this list. Are they a bad retailer? I ask because I really like your games but none of my local retailers carries them so I am stuck shopping for them online or at Cool Stuff (which is sometimes the same thing and sometimes isn’t – depending on whether I want to drive 2 hours for a game). While it’s great that there are these other retailers, they’re all going to charge me for shipping unless I spend some amount of money there, which I get. But it’s extremely unlikely that I will ever meet that threshold at another retailer. Yeah, shipping is a problem for a big box like this. My hope is that people are able to consolidate the purchase with other stuff they want for these companies. Even if it doesn’t get them free shipping, it’ll drive down the cost of shipping per item ordered. It is kind of ridiculous, isn’t it, Drew? :) But I figured if enough people wanted it, we’d make it! i don’t even have a copy of scythe yet, but the plan is in the works……might as well pick up a box that will hold all my planned goodies. is there any ONE site that i would be able to get ALL of the components including non cardboard components so i don’t have to spend as much time digging around to ensure i havn’t missed anything to pick up? Hi, may I check whether the legendary big box be able to hold the original collector box, ie keeping the entire original box inside the new legendary big box? I love the original box as well and wanted to keep it inside the new box while the other expansion on top of the original box if possible. The Legendary Box isn’t big enough to fit the original box inside of it–otherwise the lid-replacement system mentioned here wouldn’t work. Hey Jamie! Thanks for making this box! It’s fantastic. I will definitely be buying one. I just have one request – please think of us on the western half of Canada next time! I’m glad that you chose a couple Canadian retailers, but both are in the east. Would you be willing to ship to a western retailer in the future? We have a gemreat one here in Edmonton – Apt to Game! Thanks! Sorry for misspelling your name, Jamey. Autocorrect. Absolutely! That’s a good idea, and I appreciate the recommendation. Chris: We actually did end up selling some to Pixelpark, a NZ distributor, at the last minute. I’m sure they’ll sell through Seriously Board and other NZ stores. This box is ridiculous. I bet it won’t even hold the 6 Automa Decks I’ll be getting. December release huh, blatant attempt to entice all those christmas spenders. Again, just ridiculous. Okay, where do I sign up? While we couldn’t pick a retailer for every country, we offer several in Europe. Clicking may embiggen the image, but a noble spirit embiggens the smallest man. I’d it true that Broken Token is going to make a secondary set of inserts for the expansions, for this box? It’s true! Not new inserts, but inserts to add on to their previous insert. I’m surprise, there is no retailers available in France ? For this product, there are 3 retailers in Europe. A retailer would need to order a full pallet of the boxes and ship them from China, so there aren’t many retailers–in Russia or elsewhere–that can do that. Great video, thanks for showing it! I just went to preorder one of these boxes from an Australian store and both of them are out of stock. Is there any chance they will be getting more or is that it for the number being shipped to Australia. Thanks for your question, Dustin. We’ve already shipped the boxes to Australia (they’re on the way), so we can’t add more at this point. Feel free to let them know you want it, though, in case we’re able to make a reprint. The box made it to Essen after all! Mine’s a bit damp, but it’ll dry out. I was amused at the chap from Feuerland Spiele taking the trouble to caution me that it was just an empty box; I know, just take my money – I’ll not get it in the UK any other way. Looking forward to getting another layer of insert from BT/MR. Hey Jamey, looks like the pre-orders are sold out at both 401 Games and Boardgame Bliss in Canada. Any chance they’ll be able to order more? Any chance Meeplesource will be selling these? It would just be convenient to buy (and pay to ship) all promo/extra content from a single store. We talked to them about the option of doing so, but they don’t have the warehouse space. I totally understand and respect the fact that retailers have the right to price items at a level which makes sense for them financially. However, my personal opinion is that it’s brand-damaging to both restrict the group of retailers allowed to sell an item AND stand by as some of them plainly price gouge on what is certainly a highly desired and limited item, like Daedalus Productions has by pricing this item greater than 2x the recommended MSRP at 60 USD. Well, completely disregard my comment above. I completely overlooked the fact that Daedalus is including their new insert designed to house The Wind Gambit + future content. My apologies – please feel free to delete this thread, Jamey. Thanks for the correction, Travis. Please be careful about misreporting stuff like this, as it can be unfairly damaging to the reputation of a store like Daedalus. We work all the time with Top Shelf, but they decided not to carry this product. Stated as $25 MSRP, but Amazon is selling as $38.99 through Broken Table in US. Will gladly pay whatever the cost for this box, but finding it odd that it is not listed for this price anywhere I look. I think that’s probably due to freight shipping, but I’m not sure. Thanks for the speedy reply. I assumed it had to do something with shipping. Glad I have amazon Prime free shipping to mitigate any more costs included with shipping it over however. So excited to start this venture. After seeing the artwork of “The Wind Gambit” in a local store last week, I purchased it without hesitation, and later that day went into a full plunge and have started aquiring the base game with all possible expansions and extra materials, as well as the promos available now. Only that evening did I watch the trailer for the game, includig your quick guide and other “how to play” videos, and finally got an understanding of what the game was truly about. Great job on designing the layout of the packaging, as it had me sold my first glance. And congrats to the game itself of course, along with partnering with Jakub. I cannot wait to start playing today (as the base game and 1st expansion came in ealrier this morning)! Thanks William! I’m honored that you went “full Scythe,” and I hope the result is many joyous and memorable moments at your table. Feel free to join the Scythe Facebook group to share your experience and ask questions. I’m active there, and there are tons of awesome people there too. Just received my Legendary Box. I was hesitant to purchase, well, a box, but the art is phenomenal and it really soothes the completionist in me. My only complaint is that the art on one side doesn’t line up. It’s the left side with the wheel (as seen in the image above). In the image it almost looks as if it won’t line up either. Is this typical or is my lid defective? Thanks Joshua! there’s typically a small margin of error (a few millimeters) based on how the paper is wrapped around the top and bottom, so that sounds normal. Wow, thanks for the prompt reply! I understand, and I’m incredibly happy with not only this product and Scythe, but Charterstone (which my gaming group has been having a blast with) as well. Keep up the great work as we’re looking forward to new products from Stonemaier Games! I should be receiving my Legendary Box from Starlit citadel in Canada either today or tomorrow! Just through you should know, it seems that several Canadian sites are listing it as OUT OF STOCK now: Board Game Bliss, Great Board Games, and 401 Games all seem to be out. Thanks for the heads up, Kyle! I’ll update this page. Hi Jamey! Got my first few games of Scythe in this weekend and loved it! I know that there is only going to be one run of the legendary boxes. A lot of stores are out of stock. Are any more boxes going to be sent to retailers? I was at a Con yesterday and I can tell you Jamey, we want more. People were drooling over my buddies and instantly on their phones looking for one. I can tell you a lot tof the comments were something like… “$25, that’s it, oh Im in.” Im in too if you make more. Thanks for a great product. Thanks for sharing! While we can’t offer a reprint at $25 each, if there’s demand for it, we’ll make more and put them into distribution at a $40 MSRP. I’m certain they will sell out at that price too. Keep up the great work and Inspirational gaming , you have a one of a kind talent. Daedalus is out of stock. Can’t find them in the US anymore. Please make more, but don’t increase the price to $40. That’s over a 50% increase in cost. There’s no way the production cost on these increased that much in a year. We’re already loyal customers who love your game; don’t gouge us for it. $30? Sure. But $40? C’mon..
Art: I’m happy to explain the economics of making a game to you if you’d like. Are you open to that, or have you already decided that a higher price is the same as gouging? Well, the slight condescension aside, I /would/ be interested to know the reasoning behind such a drastic increase in price, yes. Unless you took a huge loss on the first round of printing these, I don’t see how a 60% increase in price is anything but a reaction to an unexpected increase in demand. Which, hey, that’s capitalism, but $40 is an entirely new board game, and for those of us that already supported Scythe to the extent of having both expansions, the extended board, metal coins, premium resources, and all other stretch goals, $40 for a box that was $25 is pretty tough to justify. And finally, if you /did/ take a huge loss on the first round, just say so. I know shipping price by dimension is high, even on empty boxes. It’s not the price that is hard for me to rationalize; it’s the huge increase. I don’t mean to condescend, but you’re making some assumptions here, and I think it’s better for you to ask questions instead of assuming. The Legendary Box is extremely expensive to make and ship. It equates to a $50 game in terms of production costs + shipping. No exaggeration. We sold the first print run at break-even to a few select retailers who also barely broke even on the box at a $25 MSRP. Why didn’t we charge more? Because we were worried about people like you accusing us of price gouging (among other reasons). We can’t do that again. It’s not sustainable to artificially deflate costs, and it’s disappointing to hear that you would ask us to continue to do that. Plus, by only selling through a few retailers (each of whom were required to buy by the pallet because it’s so expensive to ship these boxes by the carton), we ended up angering other retailers. So if we make more copies of the box, the MSRP is $40, and we’re selling to distributors, as they’re better equipped to ship to retailers in small quantities. When a publisher sells to a distributor–as we do with all of our other products, the distributor gets a 60% discount. So for the $40 product, I will make $16. That’s about a $3 profit per box after my production and shipping costs. That’s still not sustainable, but it’s better than breaking even or losing money. At the $25 MSRP you’re asking me to maintain, we would lose $3 for every box we sell to a distributor. We can’t do that, and it’s not fair for you to ask me to do that. As my survey indicates, I’m asking to gauge demand from people who are willing to buy the box at $40. You may not be one of those people, and that’s okay–no one is forcing you to buy it. But hopefully you at least now see that your assumptions are really far from the truth about this product, and hopefully you can carry this information forward when you see how publishers price their products. I would definitely purchase one of these at $40.00 if you reprinted them. Better than paying $100.00 in the resale market. I got some organizers for the base game and expansions, and would be devastated if I couldn’t fit them all in one box. maybe sell the box with the actual game included? Just curious to know if the legendary box will be restocked any time soon? Nice! thank you so much for replying! The timing on the release of the first print run meant that it just slipped through the cracks of my life. I’m extremely happy to hear that you are considering a reprint, and totally understand the need to increase the price to make it feasible. Absolutely, all components inside all 3 expansions will fit inside the Legendary Box. You may need to try some different configurations (which may or may not include the filler tuckboxes), but it’ll fit. I order the Legendary Box from GameNerdz and they told me that: The Legendary box has apparently hit some production snags, and the full release has been pushed back to a date that has yet to be determined, unfortunately. Is there a temptative date to the release date? Dimitri: Unfortunately you’ve been given some misinformation. The Legendary Box has sailed through the last few print runs in production. It’s simply a matter of demand exceeding supply. You state that the dimensions of the giant box are (300x365x196mm). Is that the external dimensions? What are the the interior dimensions of the Legendary Box? I’m trying to make an insert for it. Yes, external measurements, and the box itself is 3mm thick. Don’t you want to get the box before you make an insert for it? :) We have it in stock. I kind of imagine the best idea is to wait until you strongly feel that all the expansions of a game are finished. When the company is ready to sell the “Scythe Big Box” version with all the expansions, you could just allow current game + any/all expansion owners to just buy the “big box” without anything in it? 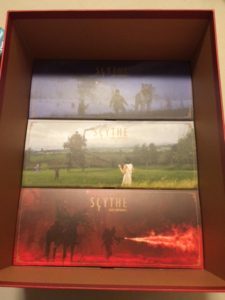 I would like to ask you if there is a plan of “scythe big box” or “collector’s edition” of some kind, in the near future. Thank you and keep up the marvellous work you are doing!